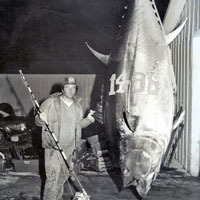 Ken Fraser owns one of the most iconic world records in heavy-tackle angling - the 1,496-pound All-Tackle record bluefin tuna. Fraser continues to target some of the world’s largest game fish, catching and releasing numerous fish over 1,000 pounds. Fraser served as an IGFA Representative for many years, supporting the organization's mission by establishing a recreational catch-and-release fishery for bluefin tuna in Nova Scotia.